IfNotNow Detroit offers a different view. 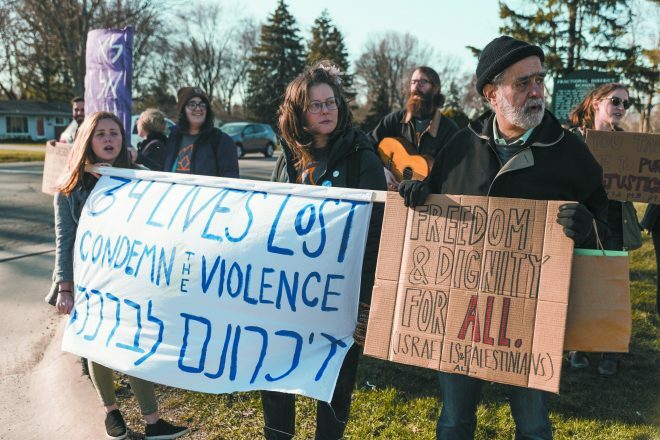 Just before the Holy Band concert at Hillel Day School’s annual Israel Independence Day celebration April 19, a group of about 15 people representing IfNotNow Detroit came onto the school’s sidewalk, unfurled a banner and began singing. Security guards and police escorted them off school property in Farmington Hills; they remained on public space on Middlebelt Road and left soon after, according to a statement from Steve Freedman, head of school. “There was never any threat to Hillel, and the matter was resolved in a few minutes,” Freedman said. The participants are aligned with IfNotNow (INN), a North American youth-led movement that seeks to end American Jewish support for what they call the occupation of Palestinians in Gaza, the West Bank and East Jerusalem. 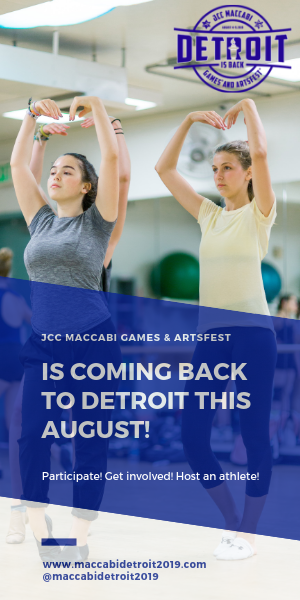 They work in a nonviolent manner that they say embraces Jewish traditions and attracts people from a broad spectrum of Judaism. IfNotNow Detroit members hold a demonstration at Hillel Day School April 19. Hayley Sakwa of Detroit is among INN Detroit’s leadership. She estimates there are 50 active volunteers, mostly from Detroit and Ann Arbor. INN has been around for about 1½ years. They meet often for Shabbat dinners, and they plan demonstrations once a quarter or so, Sakwa says. 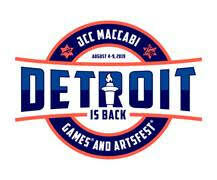 They have demonstrated at NEXTGen Detroit’s Israel-focused Blue & White Night event last June. And at Chanukah, they posted eight things they’d like day schools and summer camps to teach about Israel. Sakwa says the April 19 protest at Hillel Day School’s Independence Day event was prompted by the loss of 34 Palestinian lives earlier that month by Israeli forces during protests in Gaza at the sealed fence separating Gaza from Israel. “We feel it’s a necessity to have a Jewish voice in this moment condemning the occupation of the West Bank, Gaza and East Jerusalem on the basis that Palestinians are experiencing daily harassment and violence from this occupation,” Sakwa said. “As Jewish people grounded in justice and empathy, we can’t stand silent. We can love Israel and be critical. We can love our community and be critical of our community. In his statement, Hillel’s Freedman said, “What concerns me is that much of the criticism levied against Israel is often based on limited knowledge or selective information. The challenges facing Israel are real, existential in nature, and complex. Israel is not above criticism in the community of nations, but before we, as Jews, can have critical conversations about Israel, we need to be more knowledgeable, and be explicit about Israel’s right to exist and defend itself. ← What If We Treated Addiction Like Any Other Chronic Disease?